On the day of your surgery, you will probably be admitted to the hospital early in the morning. You shouldn't eat or drink anything after midnight the night before. The length of time you spend in the hospital depends a lot on your recovery from anesthesia after surgery. 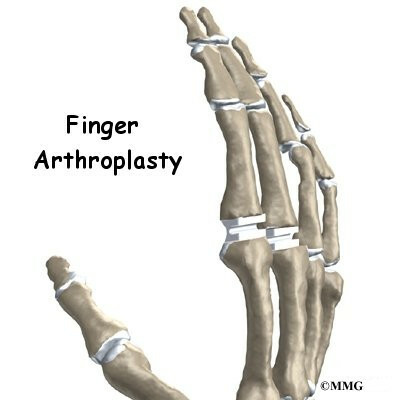 In general, finger joint surgery can be done on an outpatient basis, meaning you can leave the hospital the same day. 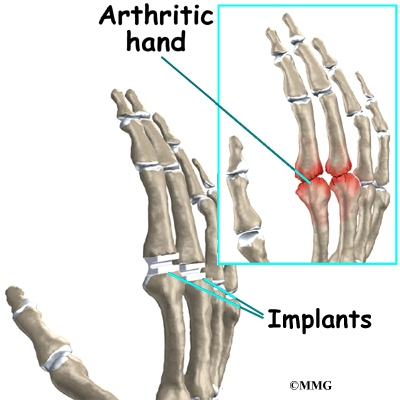 Before we describe the procedure, let's look first at the artificial finger joint itself. The procedure takes about two hours to complete. Surgery may be done using a general anesthetic, which puts you completely to sleep, or a local anesthetic, which numbs only the hand. With a local anesthetic you may be awake during the surgery, but you won't be able to see the surgery. The therapist's goal is to help you keep your pain under control, improve your strength and range of motion, and regain your fine motor abilities with your hand and fingers. When you are well underway, regular visits to the therapist's office will end. Your therapist will continue to be a resource, but you will be in charge of doing your exercises as part of an ongoing home program.